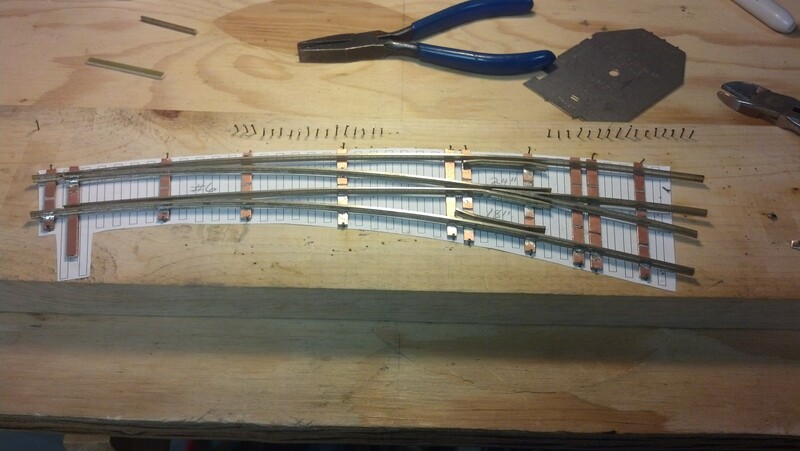 I’m learning how to build my own turnouts using a paper template and spiking the ties and rails before soldering. I have to thank “Fast Tracks” for their videos which taught me the basic steps to build a turnout. But, with several different sizes and shapes of turnouts on my layout I could not afford to purchase their metal jigs. With each turnout built I am improving my method and speed. Who knows, some day I may actually get to run a train. This entry was posted in Layout Construction and tagged Laying track on January 8, 2017 by Capt.Brigg. Capt. Brigg, that’s a great looking frog point! What was your method of filing the rails to such a good point? Also, a good looking soldering job! I’m using the same paper template arrangement to build on as you except most of my turnouts are the standard variety so I use a copy of the FastTrack ones. I do buy my track and PC ties from FastTracks as a thank you for their great templates. I use a small belt sander to take off the inside of the rail to make a fine point. I then spike the points together on wood ties and solder them to a PC board tie.